Shoebill: Your Ultimate Guide To The Fantastic Shoebill Bird! Shoebill Bird: Earth's Last Living Dinosaur? The shoebill is a large species of bird that has a distinctive bill shape unlike any other. This type of bird can be found in Africa and mainly lives in swamps. Although the shoebill bird looks like a stork, it’s not exactly the same thing as a stork, and scientists have been a little confused about how to classify it for some time. These days, it is listed as part of the Pelicaniformes order, but it hasn’t always been. These birds are also sometimes called “whalehead,” although this is much less common a term than the more widely-used shoebill. What is a shoebill exactly? Shoebills are ancient birds that have been recognized by humans all the way back to the time of ancient Egypt. 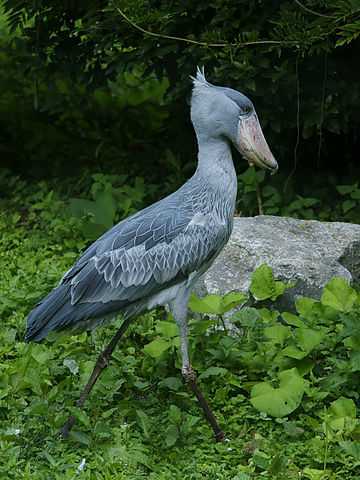 The shoebill was mislabeled as a stork for a long time, but was eventually relocated to the pelican group and is also considered to be somewhat similar to a heron. Shoebill birds lay eggs that are similar to that of a pelican and also share some DNA with pelicans. The shoebill usually comes in between 40 and 50 inches, although it may be slightly larger than this depending on the individual bird. Male shoebill birds usually weigh around 12 pounds and are a little bit heavier than female shoebills, but not by much. 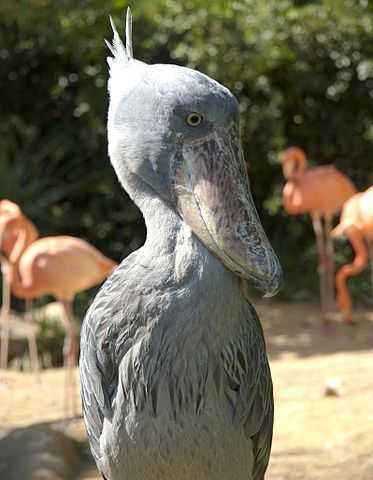 All shoebill birds have massive spoon-like bills and feature gray plumage that is brown when they’re younger. They have a large wingspan meant for soaring and short necks, unlike their stork and pelican relatives. Although their body and wings are shaped somewhat like a condor, shoebills are not related to this type of bird. Shoebill’s average size is 40-50 inches. Shoebill’s average weight is 12 lbs (male shoebills weigh more than female shoebills). Shoebills have massive, powerful spoon-like bills . Shoebills have gray plumage (it starts out brown then turns gray as shoebills age). Shoebills have a large wingspan. Shoebills have a short neck (unlike their pelican relatives). Shoebills use their massive, powerful bills to kill and eat their prey, which is usually fish. They may also eat some rodents as well as turtles and smaller birds, but this is not very common. Shoebills clatter their bills to communicate with one another, but may also rarely make mooing sounds as a form of communication as well. Shoebill: Are they an endangered species? Shoebills are not endangered… YET. The shoebill is a vulnerable species. This means that, while the shoebill is not endangered yet, it is on its way to that point due to habitat destruction and hunting. Conservation efforts are in place to prevent the shoebill from reaching endangered classification. What is its scientific name? The scientific name of the shoebill is Balaeniceps rex. The Balaeniceps genus comes from the family Balaenicipitidae, which includes only the shoebill and the hamerkop. The hamerkop is much smaller than a shoebill and doesn’t look very similar to the shoebill, despite being part of the same family. Are there different species of shoebill? Shoebills do not have different species. There is only one type of shoebill, but there are two known prehistoric relatives of this type of bird. The first is called Goliathia and was found in Egypt, and the second is called Paludavis and was also found in Egpyt, but fossilized at a different time period. Despite the shoebill descending from both of these relatives, it does not have separate types now, and the shoebill doesn’t even come in more than one color. Are there any animals the shoebill is related to? Shoebills are closely related to pelicans. The shoebill is very closely related to pelicans, which is why it is sometimes referred to as a shoebill pelican and is classified in the order Pelicaniformes. However, in the past, the shoebill was mis-categorized as belonging to the Ciconiformes order, which includes storks. The shoebill resembles a stork in its structure and shape, and this is why it is also sometimes referred to as the shoebill stork. Some scientists also feel that the shoebill is related to herons, and therefore it can also be known as a shoebill crane. Shoebill: Earth’s Last Living Dinosaur? 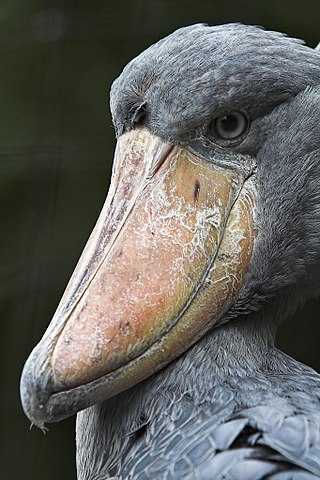 Humans have known about shoebills as long ago as ancient Egypt, when they are first referred to in written language. They did not receive a classification until the 1800s, however, when they become known to the West and specifically to Europe. It wasn’t until over a hundred years later that shoebills were reclassified. Today, scientists continue to study fossils and information about shoebills to get a better idea of what they are and how to understand them. There’s a lot more to learn about shoebills, and this information has really only scratched the surface. Understanding these beautiful shoebill birds is important, and education about these creatures will help in conservation efforts and in preventing the shoebill bird from becoming endangered. Shoebills are not particularly harmful to humans and there are no confirmed cases of death due to these birds attacking humans, pets, or livestock. They may look scary and have big, intimidating bills, but those bills are only a cause for concern for fish and some small animals. It is important to work to preserve shoebill birds and their habitats so that shoebills can continue thriving in the years to come. Learn about the magnificent beast that is the Shoebill Bird! This site is devoted to this fantastic animal that may very well be the last living dinosaur on earth! Copyright © 2019 by ShoebillBird.org.